How to Get Rid of a UTI Naturally Using Home Remedies? Home » General Health » Natural Remedies » How to Get Rid of a UTI (Urinary Tract Infection) Naturally? How to Get Rid of a UTI (Urinary Tract Infection) Naturally? Frequent and painful urination may indicate a urinary tract infection. Knowing how to get rid of a UTI fast can help relieve the pressure in the lower back, the burning sensation when urinating, and painful cramping. You may even be able to reduce the discomfort with a natural treatment for urinary tract infection. A urinary tract infection happens when E. coli bacteria, a virus, or other pathogens, invade any part of the tract, including the bladder, kidneys, urethra, or ureters. Once settled, the invaders spread throughout the tract. Urinary tract infections are the second most common of all infections reported in the United States. Of the more than two million people who contract antibiotic-resistant bacteria, 15% die from the resulting infection, making alternate and natural remedies more sought after than ever. In addition to the urgency to urinate and burning sensation, a urinary tract infection may present with blood in the urine, foul-smelling urine, abdominal muscle cramps, trembling, or nausea and vomiting. This infection is commonly seen among women but can occur in males as well, especially those with enlarged prostates. Those with a weakened immune system and who are sexually active may also be at risk for a urinary tract infection. Cranberries have been used for centuries as a natural cure for stomach, bladder, and liver ailments. These berries are also being used to treat urinary tract infections. While some studies dispute the use of cranberries to fight infection, there is evidence that the fruit’s active components may help to reduce the levels of bacteria in the urinary tract. Some studies suggest that a chemical called proanthocyanidin can prevent bacteria like E.coli from attaching to the walls of the intestines. Whether it is cranberries in pure berry form, in juice, or as a supplement, cranberry should only be ingested in small amounts and not used by those taking aspirin or warfarin. Probiotics are living “good” bacteria and yeasts used to balance the essential healthy bacteria of the gut. They are used to support and promote the digestive and the immune systems. By targeting these two key systems of the body, the harmful bacteria that lead to urinary tract infections may be treated, if not prevented, with probiotics such as kefir, sauerkraut, kombucha, and yogurt. Probiotics may also be an effective alternative for antibiotic-resistant strains of bacteria. Garlic has the anti-inflammatory and antimicrobial properties of allicin and other sulfur components to help fight harmful microorganisms. Before the development of antibiotics, raw garlic was used as a natural antibiotic herb for curing infections. In a study published in FEMS Immunology & Medical Microbiology, oral garlic treatment substantially reduced renal (kidney) bacteria counts in mice infected with P. aeruginosa bacteria. Use garlic in any form to potentially treat urinary tract infections caused by a bacterial, fungal, or viral pathogen. Apple cider vinegar has the acidic property to destroy harmful bacteria, but experts caution that it should only be used to prevent a urinary tract infection from developing. The potency of the acid may cause the already irritated tissue of the urinary tract to worsen. Use apple cider vinegar to prevent infection with its potassium content, which prevents the harmful bacteria from spreading. Another powerful preventative measure may be vitamin C. This antioxidant helps to support a strong immune system, which is needed to fight infections. Vitamin C continues to be studied as a possible treatment option for urinary tract infections. In large dosages, vitamin C has been shown in clinical trials to impair bacterial growth through acidifying the urine by affecting the pH balance. Though perhaps less effective than other methods, the high water content of cucumbers may help to flush out toxins and harmful bacteria within the urinary tract. Consume cucumber slices, in side dishes, and add to glasses of water for a refreshing drink. Green tea has beneficial plant compounds known as polyphenolic catechins, which work as an antioxidant flavonoid that combats harmful pathogens. Studies have shown epigallocatechin (EGC) in particular to have antimicrobial effects on E. coli. Because the body excretes EGC through urine in high concentrations, drinking green tea could potentially help fight UTIs cause by E.coli bacteria. The antimicrobial effects of green tea may help treat urinary tract infections, heart disease, and some cancers. Blueberries also have the antioxidant chemicals proanthocyanidins that may help prevent harmful pathogens like bacteria from invading the urinary tract. The vitamin C content of these berries may also stop bacterial growth. Consume blueberries in their purest form, or as an unsweetened juice. Celery seeds are used to lower high levels of creatinine. Creatinine is a natural waste product of the bloodstream created by the contractions muscles throughout the body. High levels detected may indicate a kidney malfunction or disease. 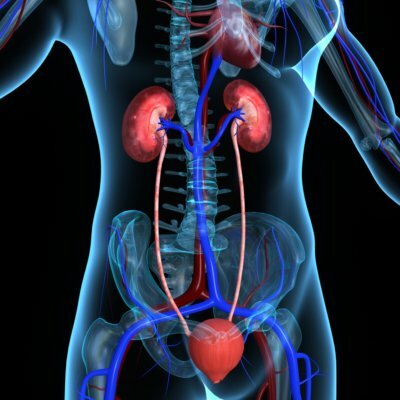 Creatinine not expelled by the kidneys may lead to a urinary tract infection. It can also be removed by celery seeds’ diuretic-like ability to stimulate the expulsion of excess water and toxins. The warmth of a heating pad may not treat the infection itself, but it will help with the pain and discomfort of the pressure caused by the urinary tract infection. Place a warmed towel or hot water bottle on the lower back or abdomen. Water is the best remedy to flush out toxins and harmful bacteria from the urinary tract. It is important to drink plenty of water to stimulate urination despite any pain experienced. Those with health conditions such as kidney failure, urinary incontinence, or urinary frequency should consult with their doctor, as excess water drinking may worsen their existing condition. With a urinary tract infection, it is vital to remove the collection of harmful pathogens within the urinary tract. Ensure that you use the washroom whenever the slightest urge is felt. A urinary tract infection can cause pain and discomfort among internal irritation and damage to the urinary tract. It is often caused by harmful pathogens such as the bacterial invader E. coli. Symptoms of abdominal pain and pressure, urine discoloration and foul odor, and the inability to urinate when the urge is great may be alleviated with home remedies. Using natural treatments may not only help when medical antibiotics fail, but some options may also help to prevent recurrence of a urinary tract infection. “Antibiotic/Antimicrobial Resistance,” Centers for Disease Control and Prevention; https://www.cdc.gov/drugresistance/, last accessed November 9, 2017. Al-Badr, A., et al., “Recurrent Urinary Tract Infections Management in Women,” Sultan Qaboos University Medical Journal, August 2013, 13(3): 359-367; https://www.ncbi.nlm.nih.gov/pmc/articles/PMC3749018/, last accessed November 9, 2017. “What is an Urinary Tract Infection (UTI) in Adults?” Urology Care Foundation; https://www.urologyhealth.org/urologic-conditions/urinary-tract-infections-in-adults, last accessed November 9, 2017. “Cranberry,” National Center for Complementary and Integrative Health; https://nccih.nih.gov/health/cranberry, last accessed November 9, 2017. Jepson, RG, et al., “A systematic review of the evidence for cranberries and blueberries for UTI prevention,” Molecular Nutrition & Food Research, June 2007, 51(6): 738-45; https://www.ncbi.nlm.nih.gov/pubmed/17492798, last accessed November 9, 2017. Goldberg, R., “Simple and Effective home remedies to treat a urinary tract infection,” Remedy Daily; http://remedydaily.com/2016/06/14/life-changing-treatments-for-uti-that-are-not-cranberry-juice/, last accessed November 10, 2017. Group, Dr. E., DC, NP, DACBN, DCBCN, DABFM, “The Health Benefits of Probiotics,” Global Healing Center, July 10, 2017; https://www.globalhealingcenter.com/natural-health/health-benefits-of-probiotics/, last accessed November 10, 2017. “Using garlic to combat antimicrobial resistant urinary tract infections,” Science Daily, July 10, 2015; https://www.sciencedaily.com/releases/2015/07/150710101332.htm, last accessed November 10, 2017. Steinmetz, K., “Can Vitamin C Be Used To Prevent Urinary Tract Infections,” ICP; http://www.icppharm.com/News-Resources/Articles/Can-Vitamin-C-be-used-to-Prevent-Urinary-Tract-Inf.aspx, last accessed November 10, 2017. Reygaert, W., et al., “Green tea as an effective antimicrobial for urinary tract infections caused by Escherichia coli,” Frontiers in Microbiology, June 18, 2013, 4: 162; https://www.ncbi.nlm.nih.gov/pmc/articles/PMC3684790/, (https://dx.doi.org/10.3389%2Ffmicb.2013.00162), last accessed November 10, 2017. “Can Celery Seed Increase Serum Creatinine,” Renal Diseases; http://m.renaldiseases.org/high-creatinine-level/1215.html, last accessed November 10, 2017.